Thus begins “The Murders in the Rue Morgue”, which first appeared in Graham’s Magazine in 1841 and is widely considered the first true detective story. Although its solution might appear fantastical, Poe’s first Dupin tale lays out the foundation for the ratiocination of detectives which followed. C. Auguste Dupin, as described in the story, is a young Frenchman of “an excellent–indeed of an illustrious family, but, by a variety of untoward events, had been reduced to such poverty…” A gentleman detective, Dupin is fond of books and the nighttime hours, and is acquainted with the police. Above all, he is extraordinarily intelligent. The beginning of the story requires careful attention as the explanation of extraordinary genius is laid out. “Between ingenuity and the analytic ability there exists a difference far greater, indeed, than that between the fancy and the imagination, but of a character very strictly analogous. It will be found, in fact, that the ingenious are always fanciful, and the truly imaginative never otherwise than analytic.” This summation follows a careful exploration of three mindsets exemplified by players of draughts (a forerunner of checkers), chess, and whist (a forerunner of bridge). Essentially, it speaks to the rare, genius individual who is master of all three games (and more) rather than those who excel at one game but not another. The unnamed narrator then relates how he first encounters Dupin at a library, their decision to room together, and the first example of Dupin’s extraordinary genius. While out walking one night, Dupin makes a curious remark. The narrator is amazed by this prescient observation, seemingly an act of mind reading. Dupin, however, merely explains the discourse that led him to know the narrator’s train of thought. A simple exercise. The heart of the story beings with an article about the extraordinary murders in the Rue Morgue. Two women savagely murdered in a locked room on the fourth floor of an apartment building. The gruesome discovery of Madame L’Espanaye and her daughter, Mademoiselle Camille, have Paris agog with speculation. Witnesses describe a violent scene. Subsequent newspaper accounts expand on the tragedy. They suggest a motive related to a bank withdrawal made by Madame L’Espanaye. Witnesses are interviewed and several claim they heard two voices two voices. One shrill. The other speaking in a foreign languages no one can agree on. A man is arrested, seemingly for the crime, but with no evidence in particular to incriminate him. Dupin then obtains permission to visit the scene of the crime, making a thorough examination of the apartments of the murdered women and the exterior environs. “Dupin scrutinized every thing,” the narrator explains, but any discourse on the crime is eschewed until the next day. “He then asked me, suddenly, if I had observed any thing peculiar at the scene of the atrocity.” The narrator had not, but Dupin has arrived at a solution. As they await a visitor, Dupin relates piece by piece the nature of the crime and its facile solution. Key to the solution is evidence disentangled from one of the victim’s clutched hand. A tuft of inhuman hair. I’ll not spoil the story’s solution, but Dupin’s visitor confirms his deductions, and the story concludes with Dupin’s pleasure at having bested the Prefect of Police in solving the murders. The first detective story with its gruesome murders, the locked room, and curious circumstance is, in many ways, an example of sensationalism. The tabloid nature of the press accounts, the hyped insolubility of the crime, and the atrocity of the crime itself heighten the anticipation for the reader. The only lacking component is an intelligent counterpart to Dupin’s reasoning. The crime, though clever, is not intentional so. There is no nefarious mastermind criminal here. In his assessment of Poe’s mystery tales, Waugh states, “They’re good and they’re bad from the standpoint of the ‘detective story.’ They’re good because they introduced into the genre which was being created, most of the permanent essences of that genre. They’re bad in that Poe, being the first to write this type of tale, was not aware of certain essences that do not go with the detective story.” (Waugh, p. 14) Of these later flaws, Waugh criticizes Poe for not including the element of “Fair Play”–“the reader must have all the clues the sleuth has” (Waugh, p. 22)–the lack of motive, and his tendency to tell what happens rather than to show it. 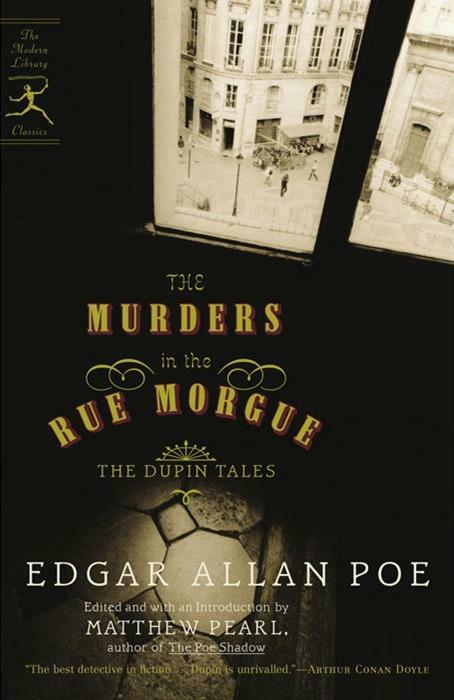 “Poe consistently withholds the keys to his stories.” (Waugh, p. 23) The narration of Dupin’s investigation of the murder scene is very perfunctory. We’re told little of what he sees or thinks in this instance and do not find out until later what he actual discovered and what it means. The clue of the inhuman hair is revealed like a rabbit pulled from magician’s hat at the essential moment just prior to the big reveal. “The Murders in the Rue Morgue” is a highly enjoyable story. It’s less a mystery for readers to solve as it is an experience to witness the mystery unfold. But it is just the first of the Dupin tales. Stay tuned for an exploration of The Mystery of Marie Roget and The Purloined Letter. In the meantime, share your thoughts of Poe and his stories. A note on the text: This review is based on the 2006 Modern Library Paperback Edition of The Murders in the Rue Morgue: the Dupin Tales, edited an with an introduction by Matthew Pearl, author of The Poe Shadow. A note in the book explains that “multiple versions of each of the Dupin tales appeared during Poe’s lifetime.” This edition uses the revised versions as they were included in the 1845 Wiley & Putnam collection and incorporates additional changes that appear in the “Lorimer copy” of the text. Author Hillary Waugh, quoted above, devoted a whole chapter to Poe and the creation of the detective story in his book, Hillary Waugh’s Guide to Mysteries & Mystery Writing. For more about this guidebook, see my review here.